If your friends and family know that you love wine, odds are good that you have been the recipient of several (if not more) wine aerators over the years. And if you’re like us here at Arrowood, most of those gadgets are unused and sitting in a box somewhere near your wine collection. The fact is, there are hundreds of distinct types of aerators out there - from fancy pour spouts to air sucking wine blenders - and all of them do one thing: add oxygen to your wine. They also all achieve the same goal, to increase flavor and soften edges, thus leading to a more enjoyable glass of wine. These devices all work to varying degrees and can be entertaining to use and show off at parties, however If you were to only keep only one, we would recommend the time-tested wine decanter. Properly decanting your bottle of wine is simple, however it can lead to several questions which can make things more complicated. What types of wine are best for decanting? How long do I let the wine sit before drinking? Do I decant older wines or younger wines? The difficult part is that there are no standard answers. Often in the tasting room the answer to questions like these is, “Well, it depends.” Decant young wine if it is tannic or tight (meaning lacking robust flavor) and decant an older wine to remove sediment or if there are off aromas that may dissipate with oxygen. However, decanting light-bodied young wines might make the wine taste flat and some older wines after decanting lose their freshness. So, these are merely guidelines and suggest that you trust your palate. After opening a bottle of your favorite Arrowood Cabernet, pour yourself a taste and answer these questions, is it delicious? – yes (well of course, it’s a bottle of Arrowood after all), but do you think it could be better? If it tastes amazing with soft tannins, bright fruit and spice (perhaps it is a bottle of 2013 Proprietary Red Wine?) it might be best just to pour away and enjoy. If you are enjoying a bottle of 2014 Sonoma Valley Cabernet Sauvignon, the act of pouring it into a glass and giving a vigorous swirl may be enough aeration. The soft, plush fruit coming from hillside vineyards such as the Smothers-Remick Ridge, make this a great younger-drinking wine. This outstanding vintage is one of my favorite Arrowood wines at the moment and I highly recommend picking some up. On another occasion, a bottle of 2012 Réserve Spéciale might be your cellar selection for the night. The initial taste is good, but perhaps it is not at its full potential. Now is the time to decant! Locate your favorite decanter and pour the entire bottle of wine into it, making sure to slowly pour down the side of the decanter. This increases the surface area of the wine, which will increase the oxygen level and will also allow you to see if any sediment is present in the wine. For older wines, we recommend letting the bottle sit upright for up to a day to allow sediment to settle at the bottom. Once the wine has been poured into the decanter, taste it again. Wines such as our Réserve Spéciale are highly concentrated and complex, which will benefit from extended time in the decanter. Thirty minutes will be fine; an hour would be even better. Your patience will be rewarded as you taste what makes this year such a stunning vintage and can truly appreciate all the complexities the wine has to offer. We will be pouring our 2012 Réserve Spéciale at our Harvest Party this October. There will always be a debate in the wine drinking world on whether to decant or not to decant, and we advise that you trust your taste buds. 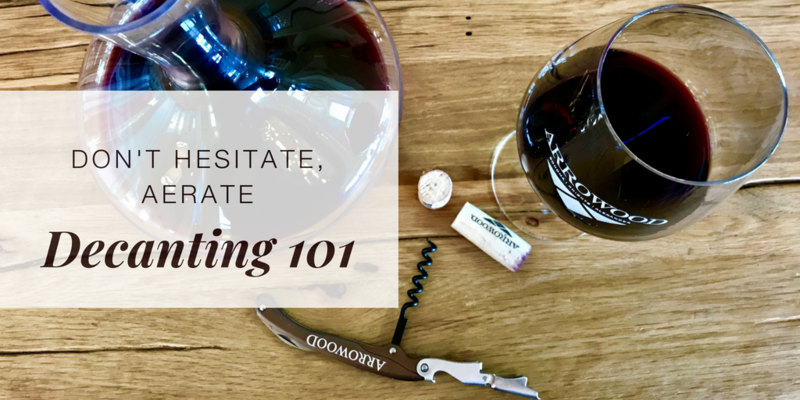 We want each Arrowood wine to express its full potential so when in doubt: Don’t hesitate, aerate.